Trench dug for drain tile with a trencher. This is the putting green after the trench has been dug, the tile placed, and then covered with pea gravel. The pattern the gravel makes is called a herringbone. Now the 4″ pea gravel blanket is being placed on the green. It is being shot by the truck in the right hand corner, then it is spread manually as you see the gentleman to the left doing. Sand spread over the pea gravel with a bulldozer. 14″ of sand will be laid over the pea gravel, which will compact down to about 12″. 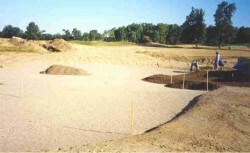 The grass seed will go directly into the sand, no topsoil or dirt is placed on top of the sand. Another photo of the sand being laid over the gravel. Here your can see stakes placed all over the putting green. The stakes are marked show how high the sand should go. This makes sure the undulation of the green is maintained during each phase. Another shot of the sand being spread over the green. This work is too delicate for the shooter that was used with the pea gravel. 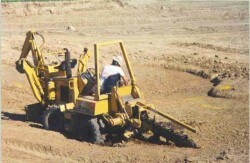 That is why it is done with a bulldozer – more time consuming, but more accurate.